Walking distance: 1.47 kilometers Estimated time of Arrival: 27 min. 1. As you step down from the train you will find yourself in the Florence train station Santa Maria Novella. 2. With your back to the train tracks exit RIGHT to the street Via Luigi Alemanni. 3. Cross the tram tracks and continue walking down Via Santa Caterina da Siena, pass the CLUB HOTEL you will find yourself in Via La Scala. 4. Cross Via La Scala and enter Via dell’ Albero. Keep walking down this street till you hit the Arno River. 5. As you reach the river in front of you will be a bridge: Ponte A. Vespucci with some parked cars on it, cross the bridge till you get to the other side. 6. The street that continues on is called Via Sant’Onofrio. Keep on walking down this street and it should take you to a "triangular shaped" Piazza that is also a parking lot. 7. Keep walking straight down and you should find yourself in Via di Camadoli. 8. Continue on the same direction and you will exit in a Piazza covered by trees. You have reached Piazza Tasso. Walk towards the bus stop and cross the pedestrian lane. 9. Cross the Viale Francesco Petrarca (big main road) you will see a quaint little restaurant called La Vecchia Bettola. 10. The street lined with beautiful trees that heads upward is called Via Villani. Walk up 20 meters, on the left hand side you will find #15 RIng the bell ! Welcome To Tasso Hostel Florence, we are happy to meet you ! BUS TICKET: You can buy bus tickets at the (TABACCHI) stores that sell cigarettes and candy inside the train Station. The single ticket comes at 1. 20 euro. You can also purchase tickets inside the bus at 2 euros each. PLEASE VALIDATE YOUR TICKET OR IT’S A 80 TO 250 euro FINE. 2. With your back to the train tracks Exit LEFT where you will see a Pharmacy. 4.) The bus has a monitor inside to inform you of your stop. 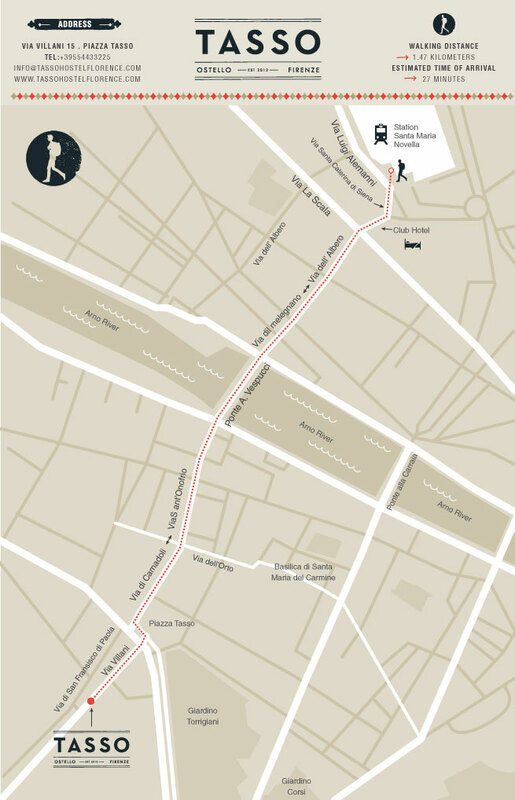 For those driving into Florence from the south of the city the most convenient outdoor parking is at Porta Romana. Parking here will limit the amount of city traffic you will have to deal with. Approaching the old city driving down the roads via Senese or viale Poggio Imperiale, you will come to a roundabout with a large white marble statue of a female figure with a long block of marble of her head. The old city’s walls will be on your right-hand side. Turn right and enter the old city’s walls through the Porta Romana (one of the old entrances to the historical centre within the city’s walls). Immediately turn left so as to drive alongside the city’s walls passing through a boom gate, you will park your car perpendicular to the old wall. The ticket collected upon entering is paid at the end of the stay. Many local Florentines pay for annual car spaces here and so you may have to drive a little way down along the wall until you reach a free spot. It costs 2 € per hour, 20€ per day. The fastest way to the city centre is to retrace your steps to the entry boom gate and walk down the ‘via Romana’ street which will take you to the Pitti Palace (circa 15minutes) and from here a few minutes further you arrive at the Ponte Vecchio and the Arno river. It is very important not to drive any further into the city after passing through the walls. There are very strict traffic restrictions in the historical centre. It is not possible to drive through the old centre between 7am-7pm. Traffic restrictions are increased during the summer months to cover also the weekends in the evenings. There are cameras at all entrance roads to the historical centre and you will be heavily fined. What to do ? Where to go? What to eat? Here is a small gift from me to you, yes its a Map that I have made for all my friends and new found friends, friends of friends that I have yet met or still have to meet. This Map has all the places I love the most about Florence. As you can see I am a big foodie and all the places here are places that has made me feel good one way or another. I will be soon coming up with Romina's top choices so you can find out for yourself what places are in Fashion or new establishments that are up. I hope this helps you fall in love with this city I absolutely adore. For more Event in Florence please click on this link and find wonderful places and shows by Florentine artists, musicians and artisans. ALL EVENTS IN FLORENCE and http://www.nottefiorentina.it/ will show you a map of everything happening while you are here.